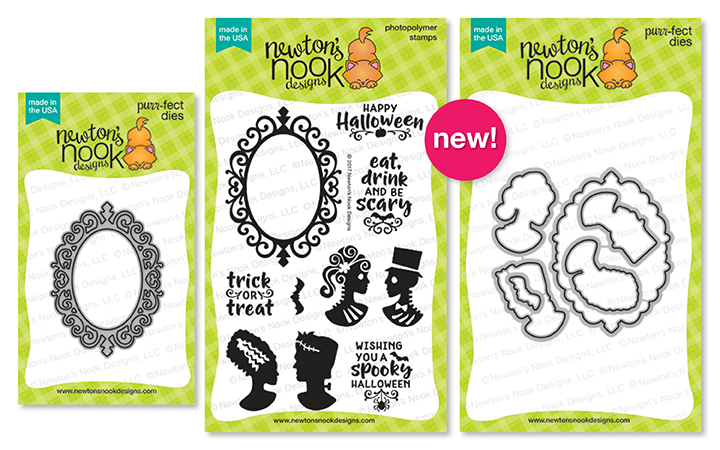 Hello friends and welcome to Day 2 of the Newton's Nook Designs September Release. Today we are getting our Halloween on and for those of us who love Halloween, that's always a good thing! The set I'm using for this card is called Creepy Cameos. I began by stamping the Mr. and Mrs. Skeleton with black ink onto white cardstock and then die cut them using the coordinating Creepy Cameo dies. 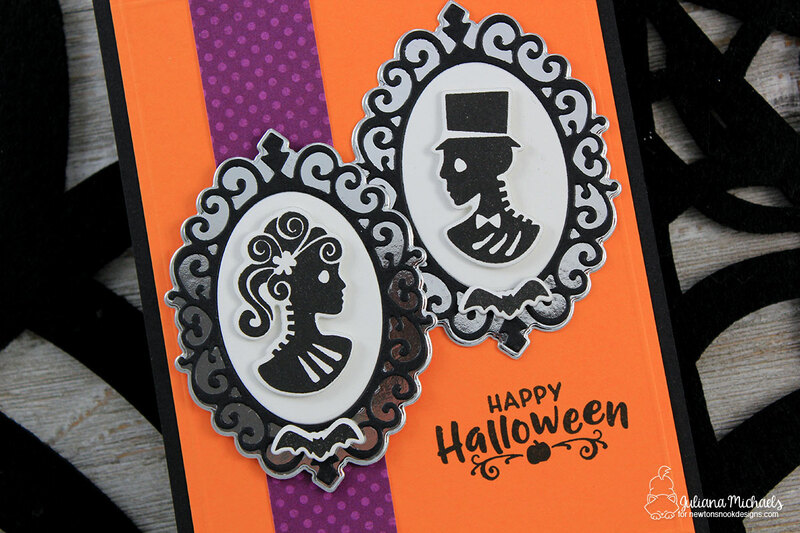 To create the frames, I used the new Cameo Frame Die to cut a frame from black cardstock. To mat this, I used the frame die from the Creepy Cameos set with a piece of silver foiled cardstock. I love that this die works perfectly to layer with the Cameo Frame Die AND the Cameo Frame stamp in the Creepy Cameos Stamp Set. This set is so much fun to mix and match and I also love how all of the sentiments fit inside the frame as well. Would you like to win the “Creepy Cameos” Stamp Set? This set will be given away to one lucky winner! To win all you have to do is comment on the NND blog and each of the Design Team blogs. The winner will be chosen at random from one of the reveal posts. You have until Thursday September 14th at 9pm CST to comment and the winners will be announced on the Newton's Nook blog post on Friday, September 15th. Your card is gorgeous. Love how you did the Cameo Frame Die. Great card, love this set! Awesome colors! Love your fun card! 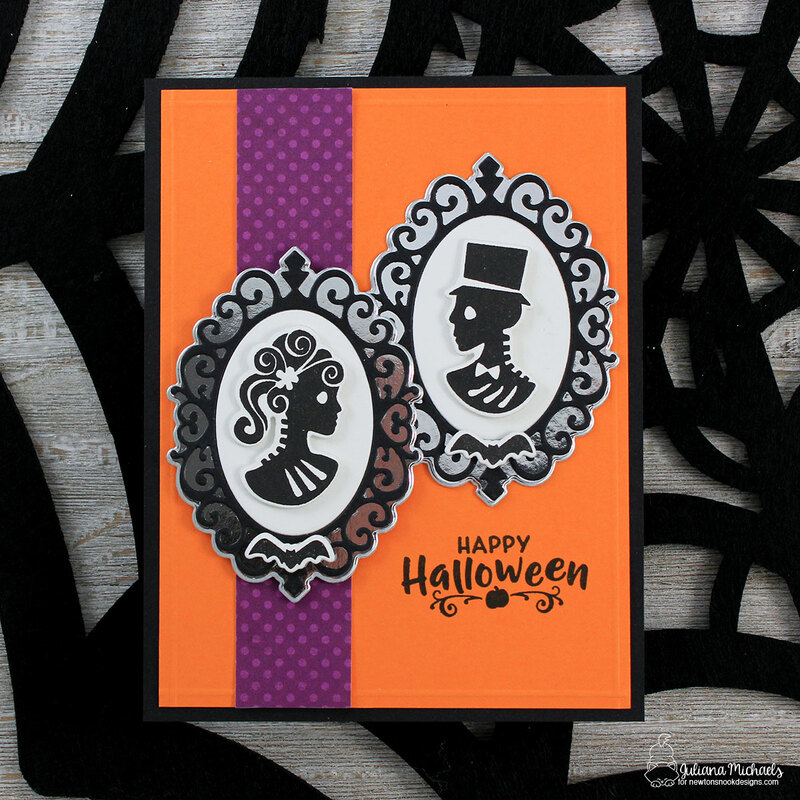 The frame and cameos are fabulous... perfect for some spooky Halloween cards! Very pretty! I love the touch of purple you added to your card....really makes everything "pop." Wow! Love your card!!!! Thanks for sharing! I love your Cameos on the silver foil paper! That makes the whole card even more fun! Creepy with cute with a great color combo! Great card and awesome colors !